The Rescue Bowl — where every dog wins! This Sunday just keeps looking better and better for animal lovers — one of our favorite Ustream animal broadcasters, Bill Foundation has just announced that’s the day they’ll be kicking off (get it?) 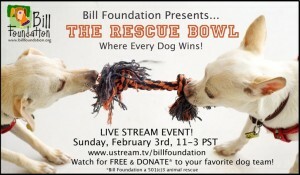 the first-ever Rescue Bowl. Team Shelter Dogs will go nose-to-nose with Team Street Dogs while Bill Foundation ‘refs’ clad in sporty football jerseys call the plays. As a viewer bonus, a selection of dog ladies promise to glam up the sidelines as cheerleaders. Viewers can also expect half-time surprises. Of course, all of this adorable action is absolutely free to watch, but those viewers who donate $5 via the Bill Foundation channel page will be able to vote for their favorite team. All donations will go directly towards the Bill Foundation’s efforts to match rescue dogs with their well-deserved forever homes. Winning team will be announced on Monday morning on facebook. May both teams win!